Little does Sarah know that in those moments of me opening the box and unpacking my Sunny Summer Swap goods she became my hero and new BFF!! Look at the amazing things this woman sent me. I'm always in need of a good travel mug. And was just thinking I needed a new one. I was excited for a mini snake skin purple boot...and then I found out it had a manicure kit inside?! SCORE!! I emailed Sarah that she just saved me money because I was in the market for some new nail polish! Love these colors. And really I think she must be psychic or broken into my house to find out what books I needed to add to my bookshelf because these ROCK MY WORLD! 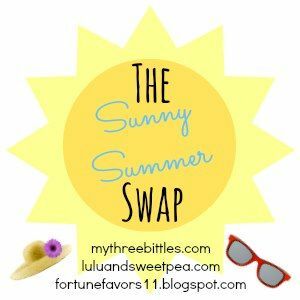 Glad you loved all your goodies - thank you for being such an awesome swap partner and thank you for joining in! !